Acclaimed author Stephen Dando-Collins sifts facts from myths of the great calamity that beset Rome in 64 AD, and uncovers the truth behind the legend that Nero fiddled while Rome burned. On the night of July 19, A.D. 64, a fire began beneath the stands of Rome's great stadium, the Circus Maximus. The fire would spread over the coming days to engulf much of the city of Rome. 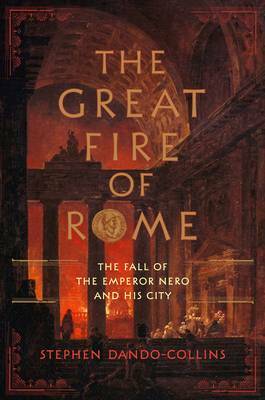 From this calamity, one of the ancient world's most devastating events, legends grew - that Nero had been responsible for the fire, and fiddled while Rome burned; and that Nero blamed the Christians of Rome, and burned them alive in punishment, making them the first recorded martyrs to the Christian faith at Rome. "The Great Fire of Rome" opens at the beginning of A.D. 64 and follows the events in Rome and nearby as they unfold in the seven months leading up to the great fire. As the year progresses we learn that the infamous young emperor Nero, who was twenty-six at the time of the fire, is celebrating a decade in power. Yet the palace is far from complacent, and the streets of Rome are simmering with talk of revolt. Dando-Collins introduces the fascinating cavalcade of historical characters who were in Rome during the first seven months of A.D. 64, and played a part in the great drama. Apart from Nero himself, these will include the notorious freedman Vatinius the dwarf; Agricola the young quaestor, leaving his pregnant wife as he set off for overseas; Pliny the Elder, workaholic author; Vespasian, former general, just returned from Africa where he was pelted with turnips; Vespasian's respected brother Sabinus, the City Prefect; young poet Lucan, nephew of Seneca, working on the masterwork he will never finish; Acte, Nero's longtime mistress, and alleged Christian convert; Petronius, Nero's arbiter of good taste; and Tigellinus, ambitious Prefect of the Praetorian Guard, who will be one of those suspected of being behind the fire. It's a pot-boiler of political intrigue and social drama. Using ancient sources, as well as modern archaeology, Dando-Collins describes the fire itself, and its the aftermath, as Nero personally directed relief efforts and reconstruction. "The Great Fire of Rome" is an unforgettable human drama which brings ancient Rome and the momentous events of 64 AD to scorching life.